STAGE DRAMA: Imagine a young man with similar mannerisms to a monkey as a result of having grown up with one. Strange and intriguing as it sounds that is exactly what will be in store for you at the British School Auditorium, Colombo, from September 15 to 20. Titled 'Memories of a Monkey Boy' this powerful dance theatre piece is based on the experiences of an exceptional youth, an outcast from society, otherwise known as the 'Monkey Boy'. The drama is as much a study of the human mind and its coping mechanisms dealing with trauma as it is a commentary on the contemporary society. The cast of this play is made up of students from the Abhina Academy of Performing Arts and participants from the Rohana Special School, Matara. Thus this is a combination of those who had been affected by the Tsunami and those who are physically and mentally disadvantaged. The stage piece is directed by Wolfgang Stange of the AMICI Dance Theatre Company. Stange specialises in integrating performers with and without disabilities. His speciality lies in teaching creative expression through dance and movement to those physically and mentally disadvantaged. For 33 years Stange had been involved in projects in theatre and education in Europe, Asia, and America. His particular method of teaching is known as 'Dance Dynamics'. "This project is very special because it involves not only people who have suffered in the tsunami and the aftermath, it also involves people who have special needs such as people who cannot hear, cannot speak and people with Downs syndrome. This is a unique combination and provides the opportunity for us to learn from each other," Stange said. He also added that the experiences from the show are drawn from the real life of the individuals. Thus it acts as a mode of realisation for them to face the reason why they suffered and to find the path in living life to the fullest. The production is pioneered by leading actress Anoja Weerasinghe, the founder of the Abhina Academy of Performing Arts. Together with the HSBC she had been involved in several theatre projects involving tsunami affected youths. "The audience of this production will realise that the physically and mentally disadvantaged are not to be pitied or cornered from the society. They prove to be hard working and dedicated just like professional actors," Weerasinghe stressed. Dinesh Subasinghe will provide the music. The production team also includes Julian Crouch and Rob Thirtle of Improbable, Phil Supple and Alison King from King Arts. STAGE DRAMA: Are you in the mood to act as a jury to a criminal murder case? Are you ready to judge the fate of a man accused of having poisoned his wife? Well that is Jeffrey Archer for you. With a note of suspense and mystery comes the novel "The Accused" by Britain's top selling novelist now turned into a play for the Sri Lankan audience and acted out by the boys of Royal College, Colombo. The drama will go on boards at the Ladies College Auditorium on September 14 to 16. "This is the second time that open forum theatre is being done in Sri Lanka. We wanted to present something different to the audience. We all love Archer and that is how this drama came to be," explained Hafeel Farisz who acts the role of Justice Cartwright in the play. He insisted that the original plot had not been altered in any manner. There will be 25 to 30 actors taking part ranging to 14 to 20 years along with the lead female role, the character of Jennifer Mitchell played by a girl. "Forum theatre is a way for the audience to expose their opinions. This play engages the audience as a jury. This means that you are not just coming to watch the play but you are going to take part in it as well. This quality is absent from the Sri Lankan theatre at the moment. That is the angle we are trying to promote - the 'You decide' concept," expressed Sajith Amendra, the director of the drama. The novelty of the play is that the audience are treated as members of the jury. It is as if they were transferred to the central criminal court at the old Bailey. They would be the ones to judge the verdict. Did Dr. Sherwood murder his wife? Was Jennifer Mitchell his mistress? Which of his alibis should you believe? This is a battle between two lawyers. Your beliefs will be subjected to a tug of war: from defence to prosecution and back and forth again. The choice will keep you on the edge of your seats and at the end of the trial you will be invited to deliver your decision of guilty or not guilty. Then the play will continue, concluding at the end. This is a discovery of the truth, the unmasking of justice and unveiling of the mystery. It is according to your verdict that the ending will be decided. 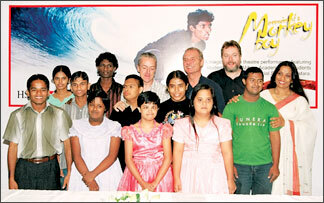 The cast includes Sanjay Jayawardena (Patrick Sherwood), Inshard Naizer (Anthony Kersley), Feroze Ahamed (Sir James Barrington), Mihiri Warnasuriya (Jennifer Mitchell), Hafeel Farisz (Justice Cartwright), Dilshan Senanayake (Inspector Payne), Yasas Ratnayake (Albert Webster), Arshad Ahmed/Mario Wijewardena (Masood Hussain), Janith Samarasinghe (Alistair Forsyth), and Kaushika Jayalath/Nadvi Mohideen (Jury Bailiff). MUSIC: Sajjad Hassan arrived at Lake House dressed in a casual T-shirt and jeans - the uniform of youth around the world but hand him a microphone and a keyboard or guitar and the metamorphosis is amazing. With a soulful voice, energetic tunes and addictive songs this young man is just steps away from stardom. The talented vocalist plus music director and composer made his debut in the music scene in 1999 when he was just 12 with a peace song, Paraviyo. He included it in his first CD Kurulu Handa along with 11 other tracks. Now after a break of nearly eight years Sajjad made a strong comeback with a chart topping track Wasantha Samaya, a collaboration with the duo Sachin and Rakitha. Sajjad's new solo single Mata Kiyanna Nam Epa was released on Sirisa TV on the programme "Looks Like" on September 8. The lyrics were penned by Nilar N. Cassim and Visharada Hemanthi Ranasinghe assisted him with the vocals. Suranga Fernando composed the script of the video. Wide Angle Productions made the video and Ashika Mathasinghe, a familiar face on the commercials and music videos acted a part opposite Sajjad. An old boy of Trinity College, Kandy, Sajjad's talent for music blossomed under the wings of Nirmala Herath and Lafir Shaheed. After winning the first place in the all island Tamil singing contest in 1999 and clinching the Ratnadeepa Award for being the first non-Buddhist child artist to sing a Buddhist song in 2001, Sajjad had made steady strides in the music scene by learning to compose music through his own effort. He is employed at the HSBC, Kandy. 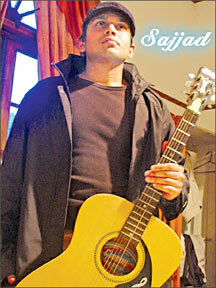 Following are excerpts of an interview with Sajjad: What is your style? "As a music director, singer and composer I listen to every style of music that comes my way. I try to collaborate the Western and Eastern styles together to give the listeners a taste of both. Wasantha Samaya was a Punjabi number while Mata Kiyanna Nam Epa is a balled. I hope to experiment with different styles of music and not limit myself to any particular category." What is the idea behind Mata Kiyanna Nam Epa? "It relates a story about a boy and a girl. The boy loses the girl according to the video. It has very touching scenes." How did this song develop? "It all started with the melody. I composed some tunes and my friend, Sajid, contributed some of the basic words in the song. I gave them to Cassim and he lined the words in the lyrics with striking meaning and rhythm." Why sing Sinhala songs and not Tamil or English numbers? "I started out with Sinhala because there is a large audience who listen to Sinhala tracks. Once I have made a market and gained recognition as a vocalist, I will move on to Tamil and English songs in future. I hope to include a mixture of all these in the CD that I would be releasing soon. Therefore the final version will be a CD which would cater to a large crowd." Who helped you on your path to success? "There are many. I am grateful to my parents, my two brothers, my music teachers at Trinity College, Nirmala Herath and Lafir Shaheed, Hilmy Ahamed, Niranga Sebastian, Sameer Jaleel, Sameera Perera and the staff of HSBC, Sameera Perera, Jaya Sri, Azam, Nazrik, Jaliya, Sajid, Sachin, Rakitha, Prasanga and Tusitha at Wide Angle Productions." TELEDRAMA: Priyanwada, Narmada and Menaka are three young sisters. Priyanwada follows a course in motor mechanics. Narmada is a law student. The youngest of the three, Menaka, has completed her schooling and is studying music. Their mother Sujatha, who has divorced her husband Lionel, has started a business enterprise and leads a busy life. Priyanwada, who has built a lifestyle with a distinct identity, is a young woman who is attuned to thinking and acting with freedom. She rejects conventional social attitudes and lifestyles that are bereft of high values. Narmada, who is totally different, esteems social status and is an ambitious person who tries to adapt herself to a high social status. Menaka still lives in a child's world. Characters from fairy tales are her heroes. Her lonely life is filled with these fairy tales. The separation of her parents, does not affect Priyanwada that much. She is capable of looking at it with an open mind. Narmada looks at from a social view-point. She resents the attitude society takes up towards her family. She looks at her mother in enmity. Although Menaka is very much affected by the loss of her father's affection, she makes a constant effort to conceal it because of her love for her mother. Separation from her husband, does not pose a strong threat to Sujatha either economically or socially. She does not have an adversarial attitude towards Lionel. She discusses with him issues relating to the children and appears with him. Although her motherly love towards her children remains undiminished, she has not got the time to find out how the children are doing because of her busy life. She has a sharp pain of mind, at being separated, but she does not show this outwardly. When she works as a lonely woman in society, she is forced to face difficulties. Lionel has got married again to a woman who is somewhat younger to him. A businessman, he owns a garment factory and several fashion showrooms. His present wife, Kumari, is a model who appeared in an advertisement for one of his fashion showrooms. Kumari makes an effort to separate Lionel from his three children. She acts with an adversary attitude towards Sujatha. She makes a constant effort, to prevent the children from being partners and share holders in Lionel's wealth. But, Lionel is not ready to keep the children away. He looks after them copnstantly. He has a strong affection especially for Menaka. As a result there are constant clashes between Lionel and Kumari. Kumari leads a highly secret life. Why she always needs money is a puzzling matter. It is revealed that at one time she had a child and that she studies abroad presently. Jayantha is an amployee who is associated with Lionel's business activities. Besides, he is an intimate friend of Lionel's. Because of this friendship, Lionel sells his house to Jayantha at a low cost. Lionel is not very enthusiastic about getting money from him. Jayantha's wife is Ramani. She is driven by a high ambition to climb high in the social ladder. They have a son and daughter. Jayantha's son is Viraj. He is a young person bent on education. He esteems traditional ways of life. He is caught up in Ramani's grip. Ramani's intention is to use him to climb up the social ladder. Their daughter, Loshi, works in a Radio channel. Her head is filled with the thought that she is a popular character in the country. Because of Ramani's uninhibited desire to associate with those in high society and those who are wealthy, she makes an effort to get close to Sujatha and her daughters. It is because of this that Viraj and Loshi associate with Sujatha's daughters. Viraj gets interested in Priyanwada, whose behaviour is somewhat unusual. Attracted by her independent thoughts and ways, Viraj starts loving Priyanwada. But, he has to make a tremendous effort, to win her because a third person has come into the scene. Narmada pays only scant attention to such subjective thoughts as love. She thinks of love as a kind of hobby. She is not interested in getting into a serious relationship. She looks at marriage as a transaction with profit and loss. Her plan is to get married a wealthy man. As a result she has got into the habit of assessing the young men who are interested in her in terms of their outward appearance and their material wealth. She is persuaded to reject a young man who really loves her because he does not possess the material wealth she looks for. Because of these traits, she had to face a very troubling situation. It is from that point that her life begins to turn upside down. A young man suitable for Narmada's thoughts is proposed to her. But, liking Priyanwada's attitudes better that young man falls in love with Priyanwada. His name is Mahela. It is he, who becomes an obstacle to Viraj's love for Priyanwada. With the arrival of these characters, a considerable number of conflicts begin to emerge in this happy family. Whatever may be the conflicts, through all these, one can see a charming love-story flowing along. Menaka, the youngest daughter, gets the opportunity to sing a duet with Duminda who is a very popular singer in the country. This popular singer is attracted by her childish ideas and gentle thoughts. Menaka too is very much attracted to this singer. But the arrival of Dilan, a young singer, between these persons, the love of Menaka for Duminda, gets restricted. Dilan is Duminda's intimate friend. Dilan too begins to love Menaka. Before Duminda could confess his love to Manaka, Dilan reveals his feelings to Duminda and prevents Duminda being attracted to Menaka. Dilan who was at first a great friend of Duminda, now becomes Duminda's enemy. In this background constant conflicts occur between Duminda and Dilan. At the end, will Viraj succeed in marrying Priyanwada as he wishes? Will Menaka be able to offer Duminda her first love? How will Narmada's fate be resolved? Senahasata Aaderai, Nalan Mendis' new teledrama, which embraces love, sacrifice, separation and union will provide answers to all those questions some day in the future. Watch it as it is brought to you on every week day from September 17 on Swarnavahini at 8.30 p.m.
Executive Producer: Hema Nalin Karunaratne.